Back in November, 2013, Jane launched her solo show JANE, which became today’s SILK-ANTRIM. The show airs Saturdays, 12-1pm ET on The Main Street Radio Network, and will be distributed by The Salem Radio Network to stations around the country. Stations can also access the program on a DELAYED basis by FTP, or via the state-of-the-art XDS satellite receiver. Additionally, streaming and podcasting shall be available. Kathleen Antrim brings a unique skill set to the Main Street Radio Network. For over 15 years, she has worked in entertainment and the media as a broadcast and print journalist, a political commentator, national correspondent and author. Antrim is an award-winning and best selling novelist. CAPITAL OFFENSE received high praise from such authors as Vince Flynn and Lee Child. Her short story “Through a Veil Darkly” is included in the anthology, THRILLER 2, edited by Clive Cussler. As a national correspondent and columnist, she wrote for the San Francisco and Washington, DC Examiner newspapers, NewsMax Magazine, and was featured as a political commentator on Hot Talk 560 KSFO radio and the nationally syndicated BattleLine. Antrim has appeared on television shows such as Hannity and Colmes. She worked on Capitol Hill behind the scenes in the United States Senate, while working on the biography of a former Governor, and then Senator, who was running for President of the United States. She’s served on the Board of Directors for International Thriller Writers as a Co-President with author Lee Child. She’s also on the Board of Directors for the San Francisco Writers Conference, and the Honorary Board of Directors for Las Positas College. 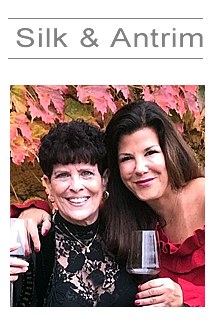 She’s been on the foundation Boards of Directors for the ValleyCare Hospital and the Livermore Valley Winegrowers Association where she was President. As an author, she has twice traveled extensively in the theater of war of the Persian Gulf and Middle East with the USO to entertain our troops. And she has also done a USO tour throughout Europe. Antrim is a member of International Thriller Writers, Mystery Writers of America, the Authors Guild and the National Press Club.